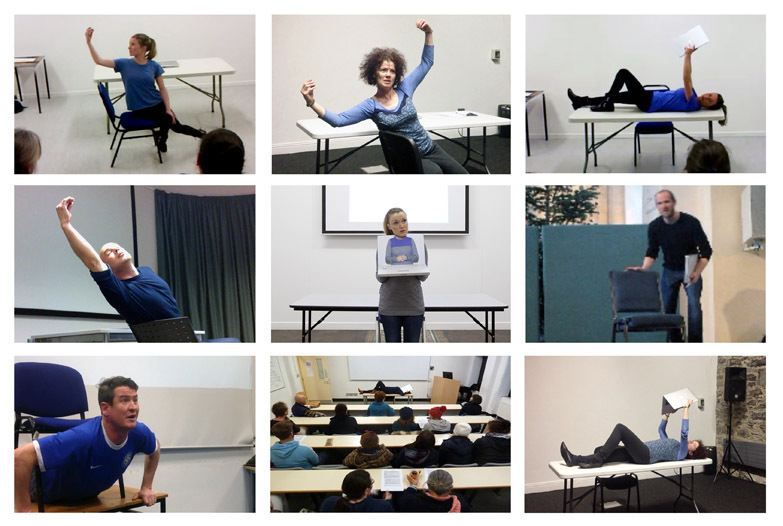 This performance-based lecture series was performed live by nine actors simultaneously in nine different venues across Ireland. The actors used rehearsed /scripted dialogue and a minimal use of props. The lecture purported to operate as an artist talk typically given at conferences/symposia. The scripted performance centres on the story of the first ever professional artwork produced by the artist (N.B. the artist was played by an actor). The artist (actor) uses the lecture format to reflect on the particular space which housed the artwork, evoking it by using descriptive language and one prop. As an artwork, the performance aims to operate as a playful commentary, critique and reflection on the contemporary discursive culture around artistic production. It uses the lecture as a conceptual framework in order to reference and capture one of the visible aspects of artistic professionalism and the relationship that current models of artistic presentation have with PR / marketing presentation formats used within the corporate world. It then attempts to stage, make visible and articulate the many conflicts and contradictions encountered by the contemporary “professional” visual artist operating within the highly competitive field of artistic play and within a “reputation-based economy”. In essence, the script performed in the piece is an autobiographic recounting of the making of an artwork. In that regard, in its writing, a literary strategy was employed in order to manage and critically consider the inherent subjectivity of memory recall and the subjective nature of art making itself. “The Synchronised Lecture Series”, was awarded The Project Award for 2013 by The Irish Arts Council and The Dublin City Council Incubation Space Award.